Research to find new malaria treatments and anti-mosquito insecticides continues. Scientists are getting closer in efforts to eliminate malaria with new genetic engineering tool. Scientists have devised a gene drive that wiped out the mosquito's populations in lab tests. The researchers changed the mosquitoes' genes with a gene drive. Gene drives use the molecular "scissors" known as CRISPR/Cas9 to copy and paste themselves into an organism's Deoxy ribonucleic Acid (DNA)/genetic material at precise locations. They're designed to break the rules of inheritance. They can quickly spread a genetic tweak to all offspring. Being unable to bite means they can't spread the malaria parasite. Males and females that inherit only one copy of the disrupted gene develop normally and are fertile. Males don't bite, whether they have the gene drive or not. Humankind's early history in Africa is coming into sharper focus with a new study of 180 genomes from a dozen ethnic groups on the continent -- some of which have never before been analysed. These preliminary results suggest that more than 40,000 years ago, two of the groups -- the San and the Baka Pygmy -- were roughly twice the size of other ethnic groups present at the time, and that the San and Baka overlapped in central-eastern or southern Africa. Many of the communities live in remote regions -- such as the Sabue people of southwestern Ethiopia -- and geneticists know little about them. 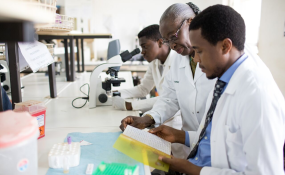 The Human Heredity and Health in Africa (H3Africa) Initiative -- an African-led consortium that supports genomics research -- has called for a more substantive role for Africa-based scientists in such projects. The last time he visited one community, he spoke with an elderly Fulani man who recalled walking 3,000 kilometres from Senegal to Cameroon as a child and told Njamnshi stories of his parents' travels. The findings also suggest that there was intermingling during that period between the Hadza, the San in southern Africa and the Baka in central Africa, all of whom were traditionally hunter-gatherers. "I think we are seeing an ancient common ancestry between the major hunter-gatherer groups in Africa," Tishkoff said. Some of the findings align with signals of mixed Hadza and San ancestry in DNA extracted from 2,500- to 8,100-year-old human remains, said Pontus Skoglund, a palaeogeneticist at the Francis Crick Institute in London. "I had been thinking about an interconnected hunter-gatherer population stretching from present-day Tanzania to South Africa." But it is plausible, she added. "There is literally nothing in Africa that is not possible since we have no idea what humans were doing on the continent 5,000 years ago."